It seems like you can’t get away from burgers these days. Look at the menu the next time you sit down to dinner. If you don’t see a burger, enjoy the sushi or the vindaloo. It wasn’t that long ago that things were different. In 2001, Five Guys was a local mini-chain with five locations scattered around the DC area. It now has 1,000 locations nationwide and 1,500 in development. We’ve also given birth to Elevation Burger and Good Stuff Eatery, both now franchising nationally, as well as local mini-chains like BGR – The Burger Joint, Burger, Tap & Shake and Z Burger. 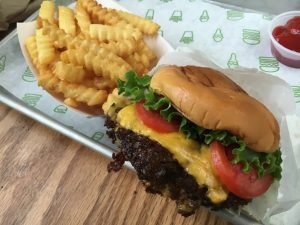 More recently, the local scrum has been joined by national chains like Shake Shack, Smashburger and Bobby’s Burger Palace. But that’s just the tip of the iceberg lettuce. 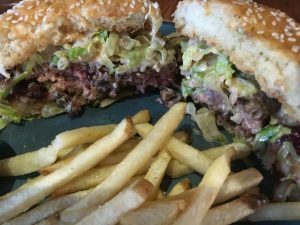 It seems like every farm-to-table joint, every steakhouse, every pub and every bistro has to have their own burger. 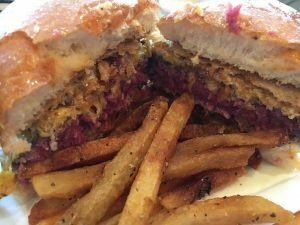 Even ethnic restaurants from parts of the world that don’t eat much beef can often sneak a lamb or salmon burger onto the menu without breaking stride. The thing to remember about a burger is that it’s essentially a sandwich. And because it’s a sandwich, proportions matter. I’d set the ideal ratio of bread-to-meat at around 1:1. In other words, the bun and meat should each contribute about half of the sandwich’s overall height. The right proportion of condiments can vary but should never be wider than the meat itself. Speaking of condiments, give me ketchup and mustard for a sweet tang, lettuce for crunch, onions for sharpness, and lots of pickles for acidity. And I’m a sucker for any kind of special sauce, especially the secret kind, even if most of them are basically thousand-island dressing. Tomatoes are good in-season; otherwise, leave them off. To add cheese or not is, of course, a debate that has ignited passions for generations. We all know what happened to the Bordens when they surprised Lizzy with her first Juicy Lucy. 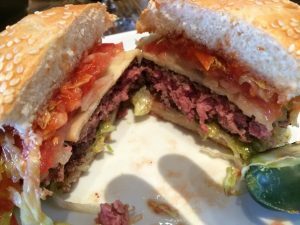 I say it’s an absolute necessity on some burgers, like a smashed roadside burger with lots of cracks and crags for the cheese to ooze into, but a medium-rare burger hot off the grill is usually just fine without the cheese. Finally — and this is important — I don’t care how devoted your restaurant is to doing everything in-house, please stop trying to make your own ketchup. Get a bottle of Heinz and call it a day. That’s what ketchup tastes like; you’re not going to do any better. It’s like trying to do a cover of “Yesterday.” Just be grateful someone came up with it and move on. 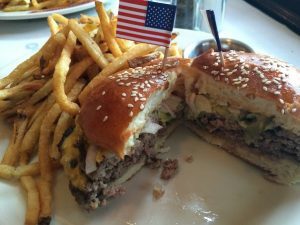 Here, then, are my favorite burgers right now in DC (and one over-priced dud). I know I haven’t covered the waterfront — I’ll barely go down there with all the construction on Maine Avenue — so let me know the places I missed. There must be some great neighborhood spots with some amazing burgers out there. Patty melts especially welcomed. Not the most expensive burger on the list but still the best. President Obama famously took Joe Biden to lunch at Ray’s in 2009 and then made a return visit with Russian President Medvedev in 2010. 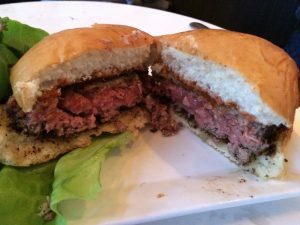 Burger meat ground in-house from cuts from Ray’s the Steaks, loosely packed and grilled to a juicy medium-rare. Meat, toppings and bun meld together into one beefy bite after another. 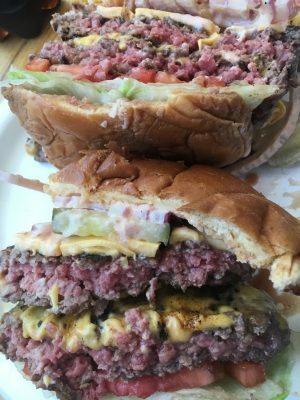 You could go for one patty instead of two and save yourself $3, but since the perfect amount of meat would be about 1.5 patties, feel free to go a little over than a little under and revel in the quality. I was reluctant to put this beauty on the list because I worried about my street cred. 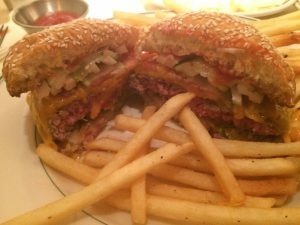 The #2 burger in DC is served at the former Houston’s restaurant in Bethesda? Seriously? Yep, ‘fraid so. This is one burger that’s not all about the meat (although the meat is ground in-house daily). 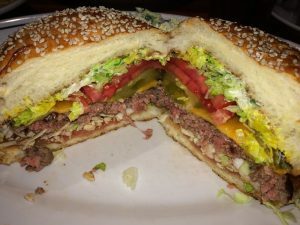 It’s about the perfect balance between all of the elements — burger, cheese, lettuce, onions, tomatoes, pickles and sesame seed bun — and the loving care that went into the construction so that you get the right amount of each in every bite. 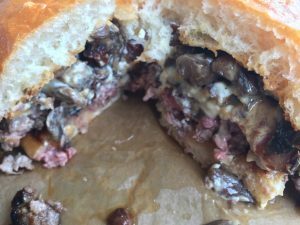 When he was with Washingtonian, Todd Kliman said this may the the best burger in town. And it is very, very good, even though double patties are only available medium-well. The cooked-through beef, onions, pickles and steamy bun tastes like an upscale White Castle — which is a huge compliment in my book. The fries, of course, are first-rate. Double-pattied angus beef from Creekstone farm gets topped with Gouda, pickles, red onion, and rocket. For an extra $3, this version topped with mashed avocados for extra messy unctuousness. Thai sweet chili sauce and garlic aioli add sweet and garlicky notes. This DC standard-bearer still getting it done. High-quality beef, well-seasoned and perfectly cooked. The crispy potato tuiles on top may seem odd, but they are essentially fancy potato chips just like Bobby adds at his Burger Palace. The folks who run Central swear they have no intention of closing after Michel Richard’s passing; still, it goes without saying that he will be greatly missed. Luscious, loosely-packed beef with bacon literally incorporated into the meat. Plenty of pickles, bonus for secret sauce and first-class fries. Well-made and lightly packed. Like Woodmont Grill, this is about the All-American condiments as much as the meat. Shredded iceberg, ripe tomato, raw Vidalias, pickles, and sesame seed bun. Tasty, loosely packed burger. Sweetish special sauce, pickles, lettuce and sesame seed bun make it taste a bit like a highbrow Big Mac. Again, to me that’s not a bad thing (see White Castle reference above). Pepperoni adds subtle smoky-spiciness and pinkish color to these juicy burgers. Egg adds egg. The only sub-$10 burger to crack the top ten. 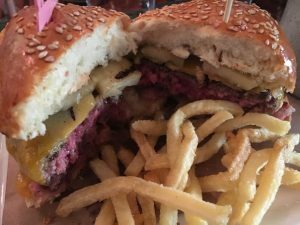 Crusty, salty, fatty beef patty is well done but juicy with melty American cheese and Shack sauce oozing into the crags. Potato roll, tomato and leafy lettuce contribute to soft mouthfeel. The crunch comes from the crinkle fries, which also double-down on the salt. Looks and eats like the classic roadside burger of your dreams. 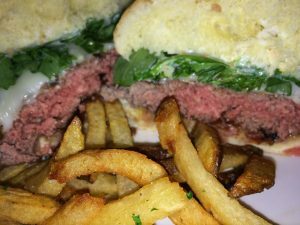 Black’s bar and lunch menus sport a very good burger. Before the burger insanity of the past five years, it likely would have been top tier. Now it’s been relegated to the top of the also-rans. The elements are all solid but none set this burger apart. Good but not great. The problems are the cottony bun and, more importantly, the bacon-onion jam. I love bacon and I love onions but this combination diminishes them both. 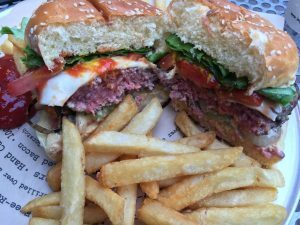 Decent grilled burger with big flavors from umami-rich condiments; comes with fries which helps explain $6 difference from Big Daddy Burger from sister restaurant BTS, below. BTS makes a fine fast-casual burger. I’d give them the edge over their closest competitor, BGR. Perfectly decent but not particularly memorable. You may forget what you had for lunch before you hit the sidewalk on the way out. Decent griddled patties, not as crusty or deeply flavored as Shake Shack. Condiments solid, including lots of pickles, although winter-quality tomatoes in August inexcusable. Thankfully, fries have gotten less greasy over the years. Components all there but total doesn’t exceed sum of its parts. Beef too tightly packed. 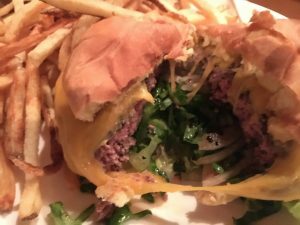 Jeff Black does a better burger in Bethesda. Decent in a pinch (aka eating at Mussel Bar). Definite taste of the grill, tastes like a backyard burger you might throw together. 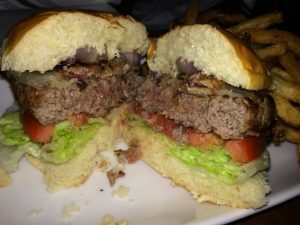 Grilling has been inconsistent, which often leads to over-cooking or under-cooking (see picture for order of medium rare burger that came rare). Condiments fine, if a bit sloppy. Could not be less exciting. To be fair, the restaurant was between chefs and someone told me I need to go back. Watch this space. 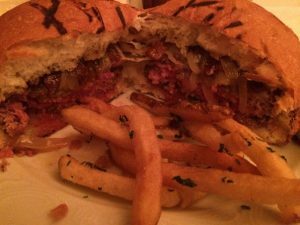 Proof that a charcuterie specialist doesn’t guarantee a good burger. Bun somewhat cottony, patty cooked well beyond ordered medium rare, probably should have sent it back. At least the bacon was delicious. 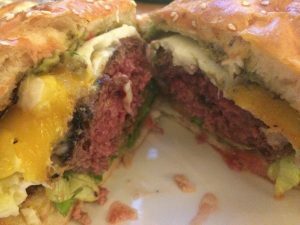 This entry was posted in Best Burgers, Best of Lists, NE, Restaurants DC. Bookmark the permalink. 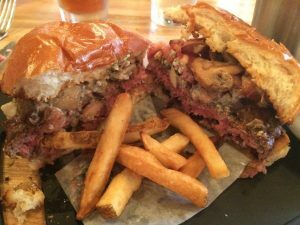 This list made me hungry but I especially appreciate the photos because it tells me which restaurants actually served the burgers rare! 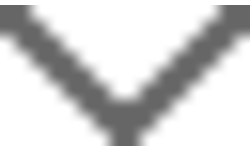 Have you ever been to Good Stuff Eaterey? 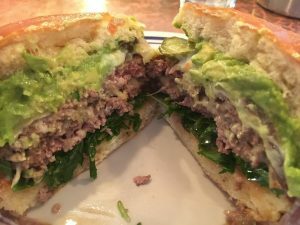 My favorite burger in DC right now. Meant to get there before posting but didn’t. Will definitely do so now, thanks. 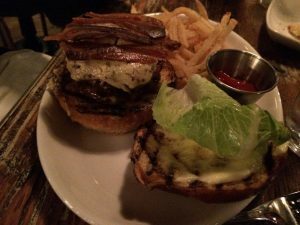 Mintwood Place has a killer burger. You must try. 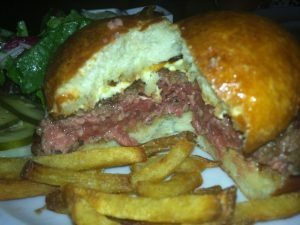 ruth chris burger is just as good if not better than rays. I go to rays in arlington blvd, because they seem to cook it better. 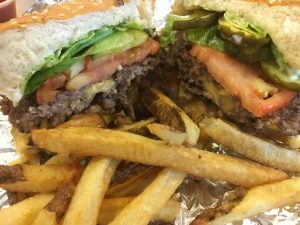 I used to go to hustons (In Rockvile 🙁 ) once a week for the burgers as well, so I agree with this list. Thanks for the tip — I’ll give Ruth’s Chris a shot!